Vision-Net has provided you with a brand new state of the art live search feature. This makes your searching experience instant and easy. The live search is located at the top of the page and is always accessible no matter where you are on our site. Full members of Vision-Net will have access to a more comprehensive search when they login, but for those who have yet to create an account will still get access to the live search, with some limits on the range of searches you can perform. The search bar is located at the top of the screen and looks like the image below. It will follow you down the page when you scroll so you can always perform a search quickly and easily. As soon as you start typing your search query the results will instantly be returned to you, getting more specific the more you type. The search will look for matches in Irish companies, businesses and directors and present them to you in an easy to read list with some vital identifying information. Clicking on one of company search results will bring you to the free company report for that company, containing other vital information. You can also type your query and press the enter key to be brought to a seperate page containing results. If your query does not contain what you are looking for you can further refine it by choosing a specific area to search in. You can choose business or directors. Clicking these options at the bottom of the results list will perform your search again but only for the selected category of search. You will then be brought to the results page containing anything the search has found. The search results page looks like the image below. In the example a company search was performed. You can see the company names and any previous name the company has had. There is also a link to the free report available for you. 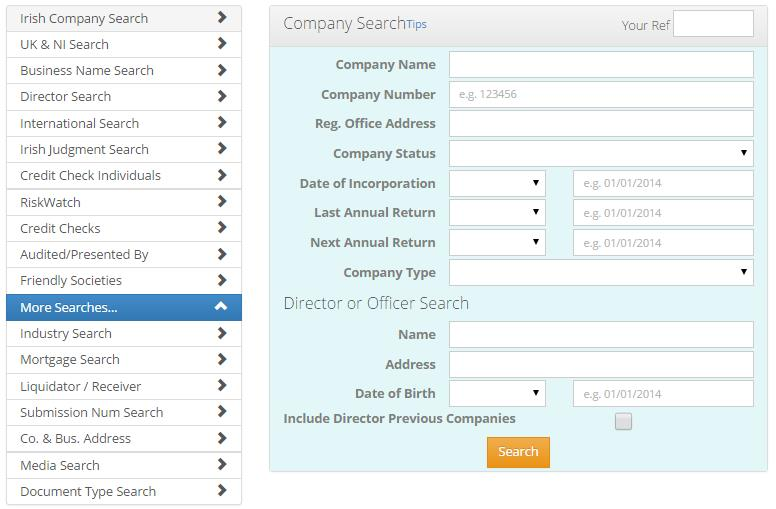 If you are searching for a director of a company just type the name of the person you are looking for. The results will contain a partial date of birth to allow you to better verify who you are looking for. The live search is located in the same place and functions in the same way as the logged out search. Now you can avail of the more comprehensive search. Searching for business owners, liquidators, receivers and examiners have all become available to you. The advanced search feature of Vision-Net is still available for you to use. This lets you perform very accurate searches based on multiple search criteria. Let your mouse hover over a search parameter for more information about it. The word "limited" is not required in any searches. Searching is broken down into specific categories. It is recommended that you select the appropriate category before running your search. 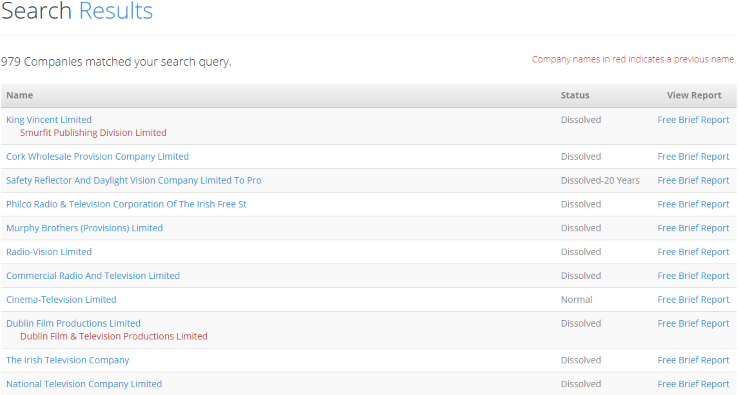 For Irish Company searches, we automatically search previous company names when searching by company name. 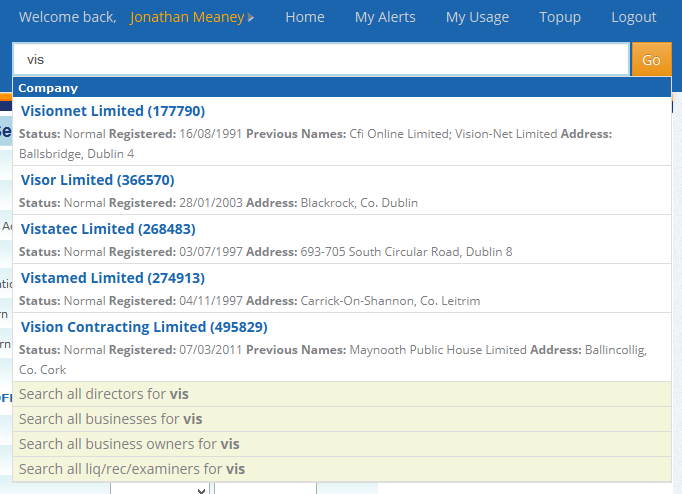 For director searches you can now return companies that a person used to be a director of to track their history. Simply select the appropriate checkbox on the "Director Seach" page. If your company search includes more than one word, exact search terms will be highlighted in yellow in the results. Including a space in your search term increases the number of possible results, because anything can be included within that space. Searching for McFadden will not return people whose name is entered by the CRO as "Mc Fadden". However, searching for "Mc Fadden" will return both "McFadden" and "Mc Fadden". Sometimes it is beneficial to include a space. Punctuation is automatically replaced with a space character, which can significantly increase the number of results returned. If you cannot find a company that you know exists, first check if it is actually a Business Name. Secondly, remove all punctuation, and enter a space whereever you are unsure of a part of the name. 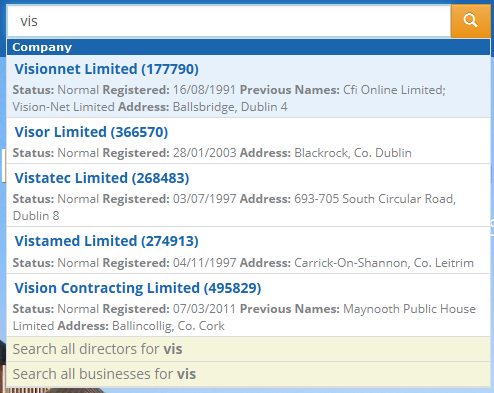 Surround your company name or business name search with inverted commas to reduce the number of results. Dates can be specified with 2 digit years but may not always achieve the expected results. Therefore we recommend 4 digit years. Please note that it is not possible to pass three *'s when using wildcards. Our Credit Reports are predicting over 80% of insolvencies at up to 6 months in advance. Check the results here.